In this post, we will first cover the motivation behind the Ammonite project: what it does, and why it exists. Then we will talk about the goals of the upcoming 1.0 release, and explore some concrete ways Ammonite has changed in the run-up to 1.0 to try and achieve those goals. In short, Ammonite 1.0 doesn't add any shiny new features, but contains a lot of work to make the existing features work better, smoother, and easier. If you've used (or considered using) Ammonite in the past and were turned off by it's rough edges, you should definitely give it another try! Ammonite: Scala Scripting is an open-source project that I've worked on for two years now. 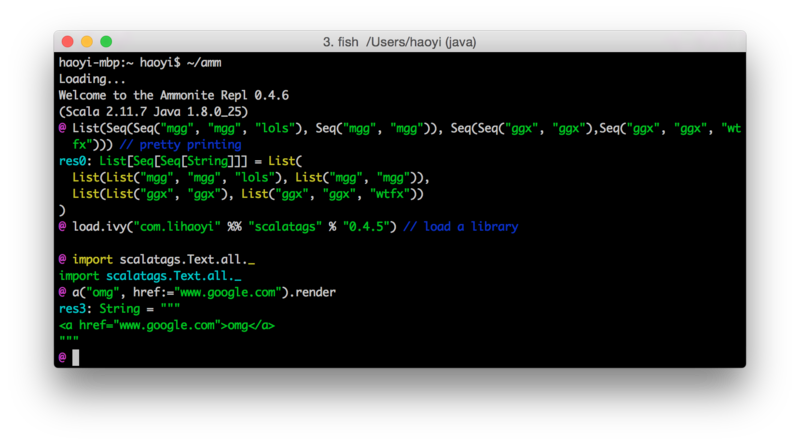 It provides an IPython-esque rich REPL experience and a way to run Scala script files. Essentially, it lets Scala compete for use in places you may previously have been using Python or Bash: for small housekeeping or automation scripts, filesystem and system-administration, and as an interactive general-purpose programming REPL. Ctrl-C kills everything; bye bye work! Note that these aren't even particularly large or complex computations; they are barely a step up from the "toy" examples that look good in a REPL. Nonetheless, they are enough to render the Print in Read Eval Print Loop completely useless! You can customize how much input you want to display, run the show() builtin to show more or less of it, or the browse() built-in if you want. to scroll through the output using a pager. This simple improvement - pretty printed output - makes a huge difference to how easily you can work with non-trivial data-structures in your Scala REPL. When computations get larger than toy-examples, it's common to spend several minutes building up the intermediate results you need. Sometimes, the data takes a while to fetch, your algorithm just needs 10s of seconds to process, or you simply need some time exploring to put together the data you want to work with. Unfortunately, it's also common to have bugs in your computations to cause them to loop forever and not terminate! Or perhaps your command will eventually terminate, but it will take long enough you want to stop it and run something else. $ // Oh no we've been kicked out to Bash and lost all our work! Again we have an issue that destroys our core REPL functionality: here breaking the Loop in our Read Eval Print Loop! The whole point of a REPL is to loop around after a command so you can run others; "kicking me back to the Bash shell" isn't part of the acronym. If you are doing serious work in the REPL, making mistakes is par for the course. Ammonite lets you recover from some these mistakes and keep going, remaining productive and making progress rather than being forced to kill the process and lose all your work. While this has some edge cases, e.g. interrupting the main thread during class-loading can cause the JVM to end up in a funny state and needing to be restarted. In practice, however, this happens pretty rarely. Even when it does happen, needing to restart your JVM once in a while is better than needing to restart it every single time you Ctrl-C! Long-running enough that Ammonite's slow startup doesn't matter, or is or computationally-intensive enough that the startup overhead is overshadowed by Scala's excellent steady-state performance. Already run using using a heavy-weight SBT project, and you want something faster, even if not super-fast. All these things are possible to do in other scripting languages, but often require setup to happen and dependencies to be installed before you can run your code. Ammonite's amm script-runner makes it totally seamless: you just run amm MyScript.sc, and everything that needs to be downloaded will be downloaded in order to make your script execute. Ammonite gives you access to the enormous JVM package ecosystem at your fingertips, and makes it all seamlessly available to you as-necessary within the smallest of your helper scripts. Ammonite-Scripts were a natural outgrowth from the Ammonite-REPL: a lot of the same infrastructure needed to evaluate Scala snippets and making their results available to downstream code is the same. The scripting facet of Ammonite was built with the help of our GSOC students Lazslo Mero and Abhishek Kumar over the two summers of 2015 and 2016. Most of Ammonite's core features have been around for ages. For example, the beautiful syntax-highlighted multi-line editing terminal has been around since May 2015, not long after the first commit in the project in Jan 2015. The ability to write Ammonite Scripts was first implemented in June 2015. Pretty-printed output was there from the very start. Given that these core features have been around for ages, what's there to do for 1.0? 1.0 doesn't mean that development is done: there are still missing features (e.g. IntelliJ Support), limitations (e.g. unnecessary recompilation of scripts in diamond-dependency structures) and leftover sloppiness (e.g. how you can import $ivy multiple versions of the same library). I'm going to explore a number of specific cases which illustrate how Ammonite 1.0 embodies these principles, compared to earlier versions of Ammonite or related tools. Coherence means that a product has an underlying logic to it, that a user can leverage to understand how to use it without knowing about the implementation. Completeness means that all the ways you can use a product work; you won't bump into behavioral "holes" where it misbehaves when used in unexpected ways. Both are important properties to have, especially for new users: they are the ones who are trying to build a mental model of how your software works, and they are the ones who will be making mistakes and trying to use it in strange ways you've never thought possible. Ammonite has traditionally had neither of these. Many of it's features were initially experimental: in many cases it wasn't clear from the start whether a feature would be possible, nevermind whether that feature would be useful. At the time it didn't make sense to think deeply about all the edge cases in a feature or how it interacts with other features. If implementing your feature isn't possible, or people don't find it useful, it doesn't matter how elegantly it handles edge cases! The @ separator, which splits Main.sc into two sections, which are compiled & run one after the other. The @ separator requires some explanation: this operator splits the script into multiple compilation-units, each one compiled and executed sequentially. This is necessary because load.module is a plain-old-function-call that processes the target script and loads it into your classpath. Thus the println(thingy) in the second block will not compile until the load.module has both compiled and executed, in order to bring the contents of Imported.sc into your classpath so the use of thingy in the second section can compile and run. Again, the load function call, the @ separator, and the "real" body of the script in needing to be in the second section. All these hoops a user needs to jump through to import a script makes sense from an implementation point of view, but they do not make sense from a user's point of view. After all, they just want to specify the script to import, or the third-party library: they don't want to be fussing around with Path objects or @ separators! In practice it was a common mistake to leave the @ out and wonder why the script isn't compiling. All the ceremony is gone: the necessity to break the script with a @, the import ammonite.ops._, quotes around pwd/'folder/"Imported.sc". Removing these greatly reduces the amount of "ceremony" around a relatively simple process: letting the user specify a script or file to import. The new import $file and import $ivy syntax behaves the same way that a Scala programmer already expects imports to work. import $file.folder.Imported doesn't just make variables magically appear in your local namespace, the way load.module() did. Instead, it brings the Imported object containing the declarations in that script into scope for you to use, just like a normal Scala import statement! Similarly, the $ivy import can happen in-line with the actual scalatags.Text.all._ import from the library, just like any other import can. The old load.ivy and load.module syntax wasn't intentionally designed to be awkward to use; rather, it wasn't really designed at all! The original feature was a proof-of-concept of script-loading and third-party-library loading, itself a novel and interesting feature. Attention was focused on making it work rather than making it easy. But now that the it is well-established as a core feature of Ammonite, both in scripts and in the REPL, it's definitely worth making work more coherently. Judging by the quantity of tickets and questions in the gitter chat room, the new import $ivy and import $file syntax has greatly reduced the amount of confusion felt by users of Ammonite when writing scripts. While coherence is making sure the features that exist fit coherently with what a user expects, completeness is making sure the user can use Ammonite's various features however they like, without bumping into cases that don't make sense or simply don't work. A good example for this is the built-in capabilities that Ammonite exposes. Ammonite started out as a REPL, and originally exposed a large number of builtin functions such as history to view the history of commands, typeOf to query the type of a value, the load.ivy and load.module builtins described above, and many more. While other REPLs like IPython or the built-in Scala REPL tended to expose these commands as special syntax (such as :history or :type), Ammonite exposes these as normal Scala functions that the user calls in the REPL, e.g. @ prompt() = "> "
@ interp.prompt() = "> "
Those that only made sense in the REPL, such as history or prompt. After all, a script doesn't have a "history" of commands, nor does it display a prompt! Those that were just as useful in both the REPL and Scripts, such as load.ivy to pull in third-party libraries, or load.module to import scripts. Scripts need to import third-party libraries or other scripts just as much as the REPL does. Initially, REPL-centric built-in functions simply did nothing when run in scripts: history was always empty, and setting the prompt didn't change anything. In the run up to Ammonite 1.0, these REPL-centric built-ins were moved into the repl object, e.g. repl.history or repl.prompt, separate from the general-purpose built-ins such as interp.load.ivy, and the repl object was simply not available to use in Scripts. As a result, it is now clear which built-ins are available to Scripts and which built-ins are only available to the REPL, and a user won't bump into an builtin that doesn't work. This brings a sense of completeness to the API that didn't exist earlier, when those builtins simply didn't do anything if used in the wrong place. Ammonite 1.0 doesn't have any major features that earlier versions of Ammonite did not have, but most of the features that it does have work much better than they used to, in a variety of ways. These are improvements to the common use case, improvements to obscure use cases, and improvements to the case where the user does entirely the wrong thing but the error message now guides them to help them figure it out. Exceptions with stack-traces are a wonderful tool during development. When something goes wrong, your program halts with a useful trace of roughly what chain of functions calls brought it to the point where things fell apart. You can then quickly figure out what caused it to misbehave, or add some logging to the relevant places, and fix your code. However, exceptions are not a good experience for the end-user: while an Ammonite developer seeing a failure may be interested in Ammonite's internal stack trace that resulted in it, an end-user would likely be more interested in what exactly they did wrong, and couldn't care less about the trace of Ammonite's internal method calls! Providing user-centric error messages in cases like these takes effort; sometimes this is easy, sometimes (e.g. in the case of failures during initialization) this requires somewhat invasive refactoring. While features are raw and fresh, and it's not clear if people would find them valuable at all, it may make sense to play "fast and loose" and simply throw exceptions in these cases, as we did in earlier versions of Ammonite. Over time, the number of people using Ammonite and making mistakes has grown, as has our certainty that our features are useful (and won't go away in a future version). Thus, in the run-up to Ammonite 1.0, a lot of effort has gone into trying to provide user-friendly, stack-trace-free error messages in the face of user error. That means rather than getting a screenful of irrelevant stack trace, a new user using Ammonite and making mistakes should hopefully receive useful feedback from the errors and quickly learn what it is that they are doing wrong. This was a limitation of the existing argument parser, Scopt, which insists on handling all arguments, and doesn't have the concept of leaving some arguments alone for downstream code to process. As someone who understands Scala, this way of presenting the information sort of makes sense, but it definitely is foreign to how "most" command line applications present their help docs. "it very very long, more than it originally was"
$ amm MultiMainDoc.sc functionB 4 "Hello"
$ amm MultiMainDoc.sc functionB --i 4 --s "Hello"
Originally the whole idea of scripts, command-line interfaces and @main methods was a novel experiment that may-or-may-not work. By now, however, these are core features of Ammonite that many people rely on, including myself. Approaching Ammonite 1.0, we have put in work to polish the command-line interface to Ammonite Scala Scripts: making it convenient, flexible, and idiomatic both to those coming from Scala and those coming from Bash. Ammonite 1.0 will not be free of issues: bugs, missing features, or limitations. However, it should hopefully be free of unknown problems. There should hopefully be no known issues which turns out to be easily fixed by a trivial patch, or mysterious issues whose cause is totally unknown. The bulk of those should be fixed, or at least investigated and understood, by 1.0. This is a hard goal to reach in a big project. While Ammonite is not a huge amount of lines of code, it is definitely complex in the number of features it contains, the third-party dependencies it uses, and how everything interacts. "my scripts are not re-compiling right when changed"
"ivy cache sometimes gets corrupted, no idea why"
$ time python -c "print 'hello world'"
$ time bash -c "echo 'hello world'"
It turns out that the Scala compiler is just inherently slow. Glacially slow. Compiling a simple "hello world" example above takes just over 1.4 seconds on my Macbook Pro, which is frankly a absurd given how fast modern processors are! This is purely running the compiler, without any of the other miscellaneous code that Ammonite contains. Unfortunately, there isn't that much I can do about this. Ammonite relies on the Scala language and thus the Scala compiler to compile it's scripts and REPL commands, so there's no getting around it. The core Scala team is hard at work trying to squeeze out improvements in Scala compiler performance this year, and the Dotty (Scala 3.0) team promises to make things faster still. So while this is a problem, there isn't that much to do to solve it in the near-term, and hopefully the core Scala compiler engineers will continue grinding away at this problem, making things better not just for Ammonite but for everyone using Scala. As you can see, the first compile takes 2.2 seconds, which is not surprising since it includes the 1.4 seconds taken to run the Scala compiler, in addition to the time needed for Ammonite's own initialization. However, subsequent "hot" compiles go down dramatically, eventually stabilizing at around 0.25 seconds for each compile. Here, we can see that a hello world Java application starts up in 0.1 seconds. Not great, compared to say Python or Bash, which take 0.03s and 0.004s respectively, but perhaps acceptable. As you can see, running a non-cached script pulls in over 5400 classfiles. This isn't unexpected, since for a non-cached script Ammonite will need to load the entire Scala compiler as well as auxiliary tools like FastParse in order to work. However, even when cached it still ends up loading over 2100 classfiles, which definitely contributes to the initial startup delay. 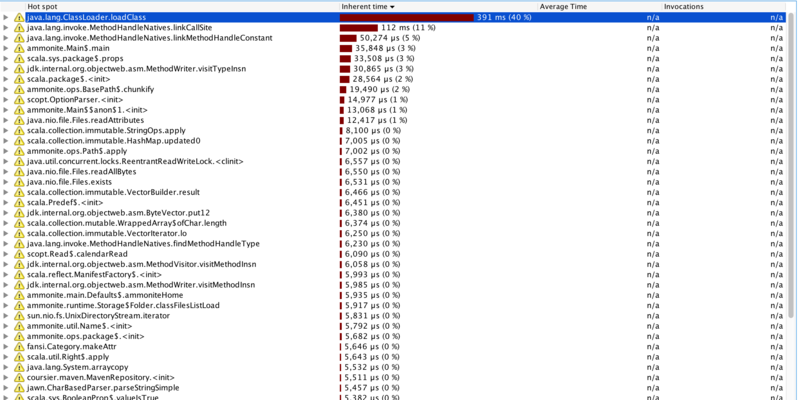 We can see that much of the time being spent isn't being spent actually running any code; it's simply the the JVM initializing classfiles and other things on-load. Speeding up the initialization code within Ammonite wouldn't help at all! Ammonite's startup time is a problem. It is a problem for the REPL, for pre-compiled scripts, and for not-yet-compiled scripts. It may not be a problem for all use cases, but it is definitely a problem for many situations where the Ammonite REPL and Ammonite's Scala Scripts could be used. Ensure that Ammonite loads the bare-minimum classes which are truly needed to run pre-compiled scripts, and not load in extraneous ones. We already do this, and there are integration tests ensuring that e.g. the Scala compiler classfiles never get loaded when running cached scripts. Port Ammonite's Scala Scripts to run on Scala.js or Scala-Native, which have runtimes with much lower startup times. This is possible, but will require a lot of work on Ammonite to make feasible, and in the case of Scala-Native we need to wait for Scala-Native itself to mature. We do not have a solution for the problem right now, but I like to think that we understand it well enough that it's not a mysterious problem. By now, it is a known quantity with some potential solutions or workarounds, some already implemented. We will not have a final solution by the time the 1.0 release is cut, to this and many other issues, but hopefully we would have understood them well enough that they will fall into the bucket of "well-understood issues". Ammonite 1.0 isn't about adding tremendous new features; rather, it's about taking the bundle of existing features and making them work tightly together. 1.0 won't be the last version of Ammonite; it isn't even the last version that will break backwards compatibility. But it is a version of Ammonite that I think will be sufficiently coherent & complete, polished, and with open issues that are known and relatively well-understood. Scala has always claimed to be a "Scalable Language", but in practice has always fallen short: people use Scala to build "big" things. Compilers, distributed systems, theorem provers, enterprise software. Traditionally, nobody used Scala to build "small" things, scripts or one-off REPL commands. For these "small" tasks, people use languages like Bash, Python or Ruby. The Scala language is concise and flexible, exactly what you need for a language you use interactively in the REPL. It can easily leverage the huge ecosystem of JVM modules, which is exactly what you want in Scripts. What bogs it down is the unfriendly-ness of the default Scala REPL and the heavy-ness of the default Scala build tool, SBT. Ammonite, with it's REPL and scripts, attempts to fix both of these. Installation instructions for the latest 1.0.0 Release Candidate are available on the Ammonite website. If you are actively using Ammonite, you should definitely upgrade. If you have used Ammonite in the past and been turned-off by rough edges and unsolved issues, you should give it another chance. And if you've never used Ammonite before, but you are a Scala developer who wants an easier way to work with the Scala REPL or quick scripts, or you are a non-Scala developer who has wanted a safer, more robust language to write their Bash scripts in, you should definitely give it a try!